In today’s overly saturated mobile app market, it’s not downloads that count, it’s retained users. Currently the average app loses 71 percent of its users within just one day of an install. That’s a startling number that every mobile team needs to take note of. App store optimization (ASO), mobile marketing campaigns and hacking to the top of the app stores just don’t cut it anymore; the markets are overcrowded and mobile users are dropping off like flies just moments after install. If teams ever hope to achieve steady mobile growth, they’ve got to focus on developing compelling onboarding experiences for new users to ensure they’ll stick around. Onboarding is the process of introducing value to a first-time user and setting them up for success. A great onboarding experience is what causes users to return and re-engage, rather than drop off and delete apps for good. Onboarding consists of three main parts: building motivation, increasing user ability and setting up triggers. All three components need to be present in order for the user to take action and re-engage. From the first open, apps need to convey strong value. And of course, it’s best to learn by doing. 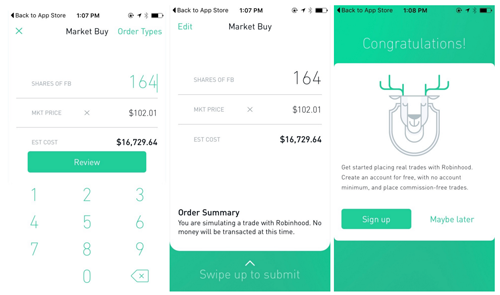 A fantastic example of onboarding through user action comes from Robinhood, a free stock trading app. The app has a free demo that allows new users to make simulated trades. The demo shows off their two strongest value propositions: free trades and a slick user interface (UI). This makes the value proposition immediately clear to any new user, while also encouraging users to actively participate. 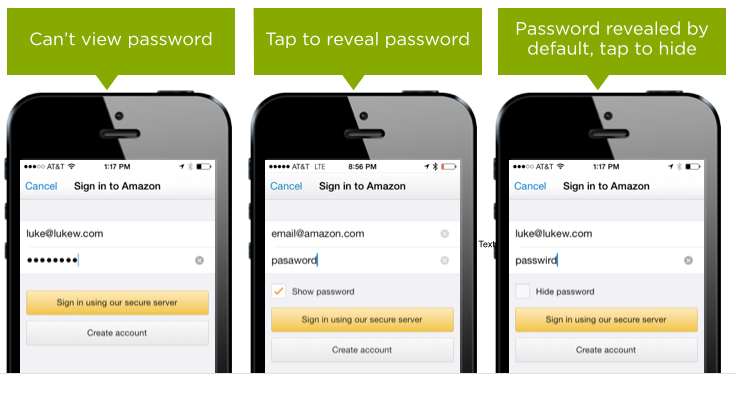 The second component of onboarding is to increase user ability. This means that users should be able to achieve their desired goals simply and easily within an app. This can range from making mobile registrations easier, to changing flows or making sure the UI is pain free to use. 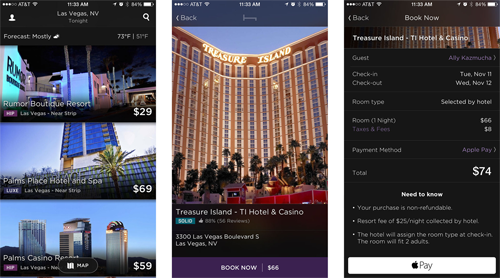 An excellent example of increasing user ability was a test run by HotelTonight, a last-minute hotel booking app. The team did a side-by-side comparison of two checkout flows: one with Apple Pay and one without. They quickly found that users purchased at much higher rates with Apple Pay due to its ease of use. Techniques for increasing user ability don’t have to be complicated. It can be as simple as labeling buttons clearly so users don’t feel confused or showing passwords during registration to ensure they typed them in correctly. The last component of onboarding it to set up both internal and external triggers. 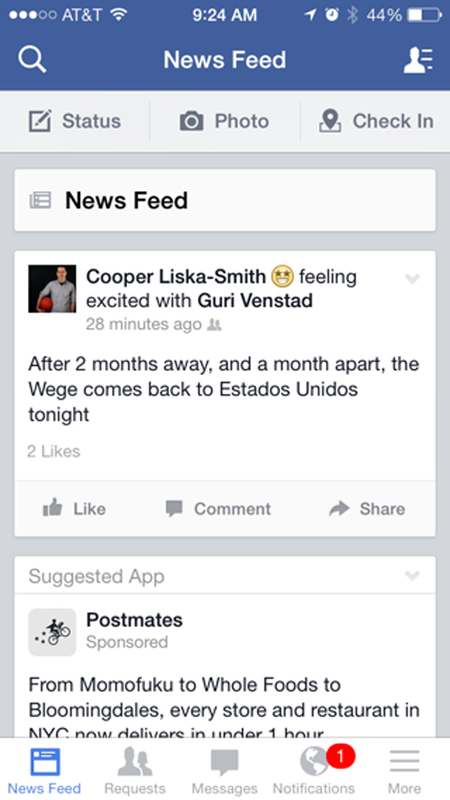 Internal triggers are habits or compulsions that cause a user to re-engage with an app. Whenever Instagram users visit the app and get blasted with beautiful pictures, they’re hit with doses of dopamine that they start to associate with the app. Over time, this conditions them to keep returning to the platform and post more frequently. Internal triggers are built up over time by providing high levels of value and utilizing tactics such as providing variable rewards to form deeply ingrained habits. They’re incredibly powerful re-engagement tools when used correctly. The other types of triggers are external triggers. 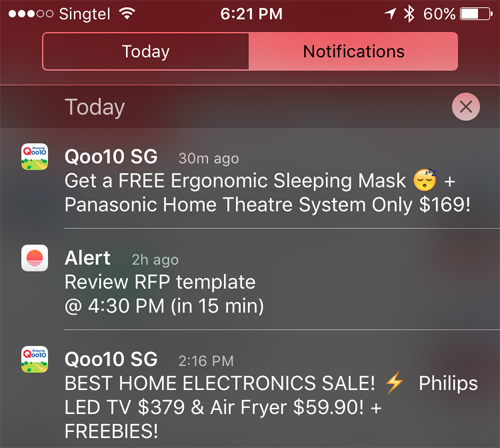 These are cues that users run across in their daily lives that remind them to re-engage with an app. They can take the form of app icons, push notifications, emails or advertisements. While they’re great supplementary tools, they are just that: supplementary. External triggers are too often used as a crutch for poor product value. They can be a powerful tool if harnessed correctly, but alone can’t cover up for a poor user experience. With the increasing overuse of external triggers as easy re-engagement tools, teams need to spend less time pushing these triggers on users and spend more time creating compelling products that users can’t help but re-engage with. Creating compelling products that re-engage users is not an easy task, especially when each app and its audiences are unique. Techniques that work for some apps may perform terribly on others. That’s why it’s important for teams to think critically about how to best implement these techniques, and test them before deploying to their entire user base. To achieve real mobile growth, teams need to focus on demonstrating value, making it easy for users to achieve their goals, and creating irresistible internal triggers that not only prevent users from dropping off, but build a strong userbase for years to come.